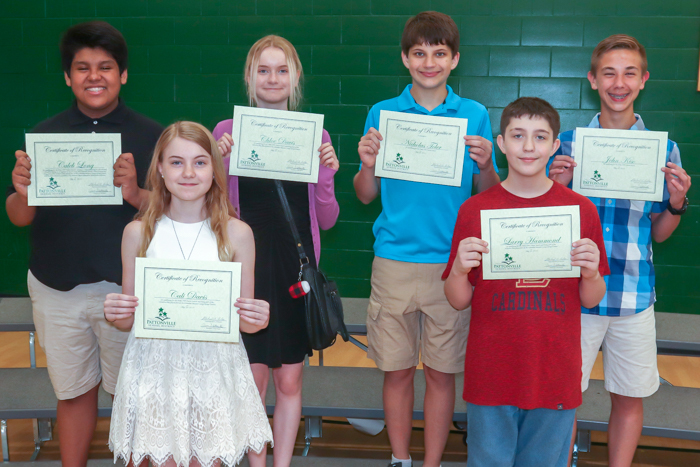 Read about the students and staff who were recognized at the May 22 Board of Education meeting. Four students earned state recognition in the Duke University Talent Identification Program (TIP). The program identifies academically talented students based on standardized test scores. Candidates who qualify based on academic performance are invited to complete either the SAT Reasoning Test or the ACT college entrance examination. Earning state recognition were Sarah Pieper, Talisa Prabhu and Jason Winkie from Holman Middle School and Ben Holland from Pattonville Heights Middle School. Also qualifying to participate in the program were, from Holman, Kelby Alca, Charles Burns, Allison Talir and Kellen Williams; from Pattonville Heights, Nathanael Damte, Cali Davis, Chloe Davis, Larry Hammond, Wesley Kiso, Carter Klenke, Caleb Long, Miranda Lopez, Sophia Maciocia, Nicholas Toler and Tara Wang; and from Remington, Zachary Nero. Earning blue ribbons in the regional science fair were Noah Fowler, Matthew Judge, Skylar Kuzuf and Jacob Snowden. Earning red ribbons were Serenity Clay, Mark Daniels, Sharon Judge, Mark Kendrick, Bailey Leedle, Suha Mesbahuddin, Natalie Smith and Taylor Volmert. James Stevens earned a blue ribbon in the regional science fair. Earning red ribbons were Riyah Altman, Sh’Vale Coplen, Hector Gutierrez, Reese Jackson, Gabby Kellner, Kaylee Mansker, DeKayla Matlock, Justin Meyer, Lydia Pan, Sheridan Phillips, Austin Traxel, Bridgett Tyarks and Tamia Williams. Colby Thomas and Sydney White earned green ribbons. Savannah Stolte earned a blue ribbon in the regional science fair and Scott Chrostowski and Tori Stewart received a red ribbon. Alexis Schmid earned a green ribbon. 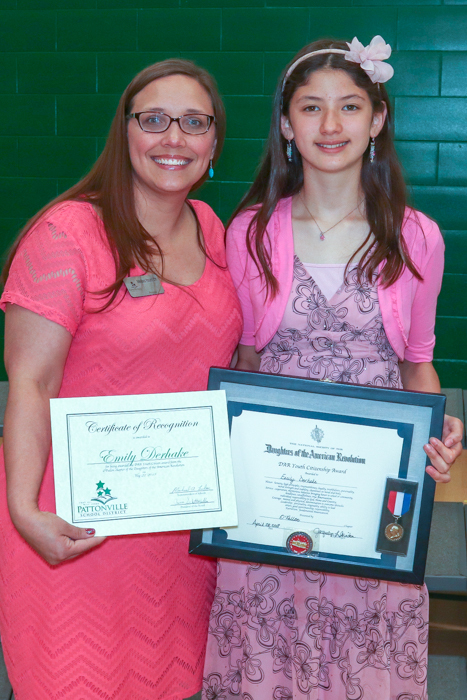 Fifth-grader Emily Derhake was selected to receive a DAR Youth Citizen award from the O’Fallon chapter of the Daughters of the American Revolution. This medal is presented to students who exemplify honor, service, courage, leadership and patriotism. Earning blue ribbons in the regional science fair were Patricha Broadus, Caden Carver, Drew Heine, Sophie Makubuya, Emerson Matulewic, Iana Medley, Becca Miller and Gracie Wilfong, who also earned a special award from Monsanto. Two students earned blue ribbons at the regional science fair: Audrey Farrell, who received a special award from the Sophia M. Sachs Butterfly House and MOST 529, and Bricyn Love, who earned a special award from the Challenger Learning Center of St. Louis. Audrey Reis earned a red ribbon. Earning green ribbons were Akasha Figueroa Rosario, who also earned a special award from Monsanto, Caleb Guss, Sophia Knize, Antania Pratt and Jayah Randall. Earning blue ribbons in the regional science fair were Kaylee Brown, Audrey Dallape, Devin Garner, Yosef Granillo, Nicholas Shao, Hadley Skouby, who earned a special acknowledgement from the American Chemical Association, and Missy Small. The following students earned a red ribbon: Daniel Clifford, Cooper Strange, who earned a special award from the Greater St. Louis Dental Society, Harrison Vandernoot, who earned a special award from the Challenger Learning Center of St. Louis, and Alexander Willingham. Earning a 1 Superior rating at the All-Suburban Middle School orchestra contest were Jasmine Gordon for cello solo, Anna Kasprzyk for bass solo and Max Chen, Diego Halbeck, Norina Shao and Jacob Zarosa for violin quartet. Logan Monroe earned a blue ribbon in the regional science fair. Dezmond Stone earned a red ribbon and a special award from Monsanto. Matthew Cutrell, Matthew Schiermeyer and Isaac Whittinghill earned green ribbons. The student journalists in Holman’s Newspaper Club placed first in the American Scholastic Press Association’s national competition. The Holman publication was the only middle school to earn first place in the national contest, making it the top scoring publication in the intermediate school category for schools with an enrollment of 500 to 1,000 students. During the last two years, the team placed second. Members of the club are: Nolan Ballard, Sofia Boughton, Howard Cooper, Sydney Hoynacki, Jeremiah Hutchins, Matthew Jacobi, Breon Jones, Talisa Prabhu, Loralai Ruzzo, DonMonique Simpkins, Sophia Tabers, Syeda Urooj Fatima and Destiny Wiser. Glenn Changar was their sponsor. Holman’s robotics team placed second at the middle school SeaPerch competition, which involves creating underwater robots that can be operated remotely. The team included Logan Monroe, Ana Richardson and Donald Simpkins. Teacher Cheryl Gragert was their coach. The following students were invited to participate in the Honors Model UN (United Nations) session: Devlin Heflin, Kaden James, Ponon Masokano and Kati Prado. Adrian Evans and Chloe Rhodes earned honorable mention. During Model UN sessions, students represent a designated country and write resolutions that support that country’s citizens and the good of the world. Teacher Christina Elkins coached the team. Akyla Baynes and Max McFarland earned two 1 ratings at the Solo and Ensemble Festival for band. Earning a 1 rating at the festival for their solos were Ashley Bly for French horn, Zion Bradsher for snare drum, Rebecca Griffin for B-flat clarinet, August Heiligenstein for tuba, Jordan Jackson for tenor sax, Julia Marroquin for trumpet, Ava Reynolds for keyboard mallet, Jacob Silverstein for snare drum solo, Sydney Suvansri for B-flat clarinet and Isabelle Usry for alto sax. Earning a 1 for percussion ensemble were Alliah Allen, Samantha Green, Davionna Mosley, Markelle Robinson, Sadie Shull and Destiny Wiser. For trios, the following students earned 1 ratings: Anna Burke, Lillian Cave and Selena Riede for clarinet trio and Cecilia Hernandez, Stephanie Reyes-Damian and Rontina Smith for flute trio. For mixed brass quartet, Ryan Bax, Charlie Burns, Kyle Kaemmerer and McFarland earned a 1 rating. Adam Hall and Steven White direct the band students. Orchestra students Tara Chandler and Elly Lu earned two 1 Superior ratings at the Solo and Small Ensemble Festival. Sophia Boughton and Aaron Wolz each earned a 1 Superior and two 2 Excellent ratings at the festival. Also earning 1s were Kenedi Jenkins, Emma Kasicki and Talisa Prabhu. Earning two 2 Excellent ratings were Ponon Masokano and Melanie Rivera Nunez. Also earning 2 ratings were Samantha Beasley, Jahlil Johnson, Casandra Medley O’Brien, Owen Sandheinrich and Emma Schonhoff. In addition, the eighth-grade orchestra earned a 1 rating at the Battle High School contest in Columbia. The students who participated were: Boughton, Olivia Bulger, Marshall Carlton, Chandler, Sarah Etwaroo, Kaitlyn Flippin, Isabella Hall, Devlin Heflin, Harry Heitmeier, Kasicki, Lauren Keller, Lu, Masokano, Samara McClendon, Alondra Mendez, Raizel Mendoza, Kaitlyn Musselwhite, Kati Prado, Rivera Nunez, Alex Rugerio-Romero, Savannah Sowell, Jessie Stark, Jasmine Taylor, Cameron Thomas, Miles Vance, Orney Walker, Daonne Wallace, DeAndre Westbrook, Carliyah Williams and Wolz, a seventh-grader. The orchestra also earned a 1 rating at the All-Suburban Large Ensemble Festival. Students who participated were: Beasley, Boughton, Bulger, Carly Caesar, Carlton, Chandler, Etwaroo, Flippin, Hall, Heflin, Heitmeier, Matthew Jacobi, Jenkins, Johnson, Kasicki, Keller, Lu, Masokano, McClendon, Medley O’Brien, Mendez, Mendoza, Musselwhite, Sarah Pieper, Prabhu, Prado, Rivera Nunez, Rugerio-Romero, Sandheinrich, Schonhoff, Bailey Shields, Sowell, Stark, Taylor, Thomas, Vance, Walker, Wallace, Westbrook, Williams, Derek Wiser and Wolz. Teacher Irena Goren-Scheer directed the orchestra. Choir students earning a 1 rating for their solo at the Solo and Ensemble Festival were Greg Mosley, Ja’nya Cruise and Wyatt Mackenberg. Kam Ren Brown and Nicole Orozco earned a 1 for their vocal ensemble. Larry Knobel directed the choir. Caleb Long earned a 1 rating in cello solo and a 2 rating in string duet at the St. Louis Suburban Music Educators Association Solo and Small Ensemble Festival. Also earning a 1 rating at the festival were Charley Bennight for violin solo, Meagan Holder for violin solo, Helen Bae for string duet, Jazara Word for string duet and Tara Wang for string duet. Nya Coleman and Bryan Le also earned a 2 rating in string duet. The following orchestra students also earned first place at the Columbia Missouri Large Group Contest: Bae, Emsley Bailey, Lauren Barton, Bennight, Ida d’Almeida, Cali Davis, Chloe Davis, Sophia Faasen, Joselyn Gamino Pinon, Sasha Grant, Peyton Gregory, Larry Hammond, Jasmine Harris, Olivia Hernandez, Holder, Tate Holt, Alexia Jolliff, Anna Kasprzyk, Le, Caleb Long, Gavin MacDonald, Christina Ngo, Ty Procter, Rana Qasem, Rapheal Seymour, Melina Staats, Charlotte Taylor, Diana Urbina, Benjamin Wallace, Wang, Aidan White and Word. The orchestra was directed by Carlye Feeney and Kim Gindler. The choir at Pattonville Heights was selected to perform at the Missouri Music Educators Association Conference. The choir was the only middle school in the state selected to perform. The students who participated were: Camden Adams, Dinara Aladinova, Dominick Austin, Umar Barrie, Ka’Nia Barton, Gabrielle Beckham, Mikah Bradford, Dominique Bradshaw, Austin Branson, Haley Brown, Trevon Chestnut, Ephrata Demissie, Tamia Dockett, Nikolas Dominick, Nicholas Dudley, Da’Shon Dunn, Samauria Eason, Samaya Eason, Samantha Erickson-Karanja, Valeria Escaray, Patrick Ferguson, Julia Forczek, Caraline Guetschow, Allyssa Hall, Kylan Harlan, Maliyah Harris, Isabelle Hatfield, Brooklin Hatley, Ethan Haughton, Amaya Hayes, Kateryna Horbanova, Haley Johnson, Matthew Kliethermes, Chelsey Laughlin, Abigail Lewis, Sarah Lewis, Caleb Long, Miranda Lopez, Connor Lorino, Ethan Massey, Jayla McCall, Ruth McCarron, Daniel McCoy, Madeline McCoy, Jacob Mendelsohn, Briana Moore, Brooke Moore, Sarah Nelson, Maichi Nguyen, Alaina Parsons, Tanae Peebles, Tania Peebles, Tony Porter Jr., Amy Prueitt, Sierra Rayford, Lily Reynolds, Samantha Sarkissian, Devin Scharer, Kaylee Schroeder, Sierra Schuster, Ziah Sheppard, Xavier Smith, Olivia Stroker, Abem Tamirat, Jameka Thomas, Timothy Tolen Jr., Alejandra Torres Gonzalez, Tachinnah Tyler, Autumn Varner, Larissa Vassallo, Stephanie Wallace, Zhi Wallace, Tara Wang, Victoria Welty, Natalie Whittinghill, Javan Williams and Hannadey Yezza. The choir is directed by Tracy Baker. Senior Josh Royal placed third and earned a $4,000 scholarship after competing in the St. Louis Teen Talent Competition. He was one of only 15 finalists in the competition which took place at the Fabulous Fox Theatre. Junior Terrell Henderson was selected to attend three prestigious summer college programs. He will attend the Summer Academy for Math and Science at Carnegie Mellon University and the Applied Science and Engineering session at the Yale Young Global Scholars program. He earned full scholarships for these programs and will live on campus and attend lectures and seminars by school faculty. He was also accepted into the Brown Environmental Leadership Lab: Rhode Island Program at Brown University. Students selected to 2018 American Legion Boys State of Missouri Program were Nolan Prebianca and Daniel Smith. Students selected to Missouri Girls State are: Mikayla Bridges, Juveria Fatima and Brittany Strasburger. Sophomores Ayana Griffin, Erin McMahon, William Skaggs and Camilla Wilkerson were selected to attend the Missouri Scholars Academy, a three-week academic program for 330 of Missouri’s gifted students who are ready to begin their junior year in high school. Isabel DiSalvo, Kamilah Kirkwood and Carleigh Lindsay earned first place in the Inside Our School video competition of the Educators Rising state competition and conference. Their video showcased how teachers incorporate project-based learning in their classes at Pattonville. Anderia Inman, Becky Kaufman, Carter Kennedy and Ashlyn Midkiff also competed in the children’s literature competition. Tressa Jones and Devon Linhardt also attended the state conference. The group was accompanied by family and consumer science teachers Mary Favazza and Janet Kuhn. Educators Rising is a national organization for aspiring teachers which includes a school-based program that helps young people explore teaching as a career. Chloe Neal placed in the top eight in the business services management category at the state DECA competition. Also competing at state were Taityanna Beard in human resource management, Gabrielle Shipman in the food marketing series and Kelsey Van Hook in the retail merchandising series. Kathryn Wentz participated as a Leadership Delegate. Teachers Holly Martinez and Doug McGhee coached the students. Junior Will Polster qualified for the National Speech and Debate Association (NSDA) national tournament after placing first in informative speaking at the Eastern Missouri NSDA District Tournament. He also qualified for state in U.S. extemporaneous speaking after placing second at the Missouri State High School Activities Association (MSHSAA) District Tournament, where he was also quarterfinalist in public forum debate. In addition, Polster earned the NSDA’s All-American award. Also at the NSDA district tournament, Shaylyn Scheer and Ke’Aira Henderson placed third in duet interpretation and are first alternates for the national competition. At the MSHSAA district tournament, Patrick Hachmeister placed fourth in humorous interpretation and was a quarterfinalist in Lincoln-Douglas debate, Nolan Prebianca placed fourth in radio speaking and was a quarterfinalist in public forum debate, Brittany Strasburger placed sixth in dramatic interpretation and seventh in storytelling and Jailah Broadway placed seventh in original oratory. At the Francis Howell North Events Tournament, Strasburger placed sixth in storytelling, Devin Zahner placed fifth in varsity international extemporaneous speaking and Harith Al Yuwaili and Mohaimen Al Yuwaili placed sixth in novice duo interpretation. At the Greater St. Louis Speech Association Conference Tournament, Anna de Garcia and Eden Magana Lopez placed second in novice public forum debate, Juveria Fatima was the top novice in varsity policy debate, Strasburger placed second in storytelling and fifth in radio speaking, Camilla Wilkerson placed first in novice radio speaking and was the top novice in varsity policy debate. At the Greater St. Louis Conference Preseason Tournament, Eli Card placed third in novice impromptu speaking, Kaliahna Carroll placed first in duet improv, Rachel McCormick placed first in duet improv, Brianna Smith placed sixth in varsity duet improv, Strasburger placed sixth in varsity duet improv and Harith Al Yuwaili and Mohaimen Al Yuwaili placed fourth in duet improv. At the Parkway West Tournament, Hannah Berg was a semifinalist in novice radio speaking, Emily Lu was a semifinalist in prose/poetry, Isabella Tucci placed fifth in novice radio speaking, Edmond Zhang was a semifinalist in varsity domestic extemporaneous speaking and Harith Al Yuwaili and Mohaimen Al Yuwaili placed first in top novice duo interpretation. At the Troy Buchanan Debate Tournament, Fatima placed fifth in novice policy debate, Lacey Harder placed sixth in novice policy debate, Lu placed third in novice Lincoln-Douglas debate, Tajh Martin placed sixth in novice policy debate, McCormick placed sixth in novice policy debate, Tucci placed second in novice public forum debate, Wilkerson placed fifth in novice policy debate. In addition, the following students were part of the speech and debate team that placed fourth in overall debate sweepstakes at the Troy Buchanan Debate Tournament: Krista Baught, Card, Lihn Chittakhone, Adam Kendrick, Mariyah Simpson, Xmiena Rogers Stamps, Aubrey Tendiel and James Vie. Jennifer Raymond coached the team. Natalie Baugher earned a 1 Exemplary and three 2 Outstanding ratings at the Solo and Ensemble Festival. The following students earned two 1 Exemplary ratings: Sarah Hasekamp, Raven Hayes, Joey Noble and Emma Stubblefield. Evan Clark, Hannah Robinson and Trevor Vigus each earned a 1 Exemplary and 2 Outstanding rating. Savanna Wooten earned two 1 Exemplary ratings and a 2 Outstanding rating. Amber Whitfield earned a 1 Exemplary ratings and two 2 Outstanding ratings. The following students earned a 1 Exemplary rating: Leslie Azwell, Sarah Baker, Kyle Beaver, Makyla Boyd, Olivia DeGalvez, Nichole DeKoster, Layla Dukes, Dorian Green, Laura Harder, Caleb Hughes, Tiaira James, Louis Johnson, Carter Kennedy, Kesley Kobielusz, Owen Moeller, Alex Newett, Sam Shull, Darci Webber and Alexis Wysocki. Becky Kaufman and Thomas McFarland earned two 2 Outstanding ratings. 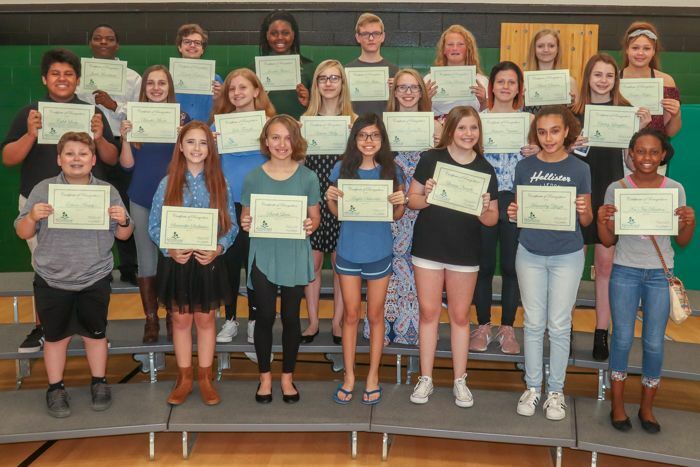 And the following students earned one 2 Outstanding rating:Maddie Branson, Andrew Brown, Bryan Burns, Kaylee Buttry, Nathan Condado, Daniel Enberg, Sam Esteep, Ryan Geiger, Van Grabner, Shaleen Gupta, Abigail Hachmeister, Molly Hanford, Logan Harder, Cora Hautekeete, Annie Hicks, Molly Hladky, Emily Johnson, Sophia Jones, Morgan Kaemmerer, Collins Karanja, Ally Keefer, Taylor Knight, James Lyerla, Kaitlyn McKinley, Summer Miller, Sam Reynolds, Rachel Riley, Matthew Samuel, Cierra Spainhoward, Elise Thompkins, Abigail Twyman, Morgan Vaughn, Silvia Vega Ramos, Rosie Vishy and Kelly Widiger. The band is directed by Denny McFarland, Sara Deutschmann and Anna White. At the State Solo and Ensemble Festival for orchestra, Lacey Harder, William Skaggs, Abby Surlet and Maiya Varner earned gold for bass quartet. Earning silver at state were: Adam Mitchell and Natalie Young for violin solo; Surlet for bass solo; Amelia Khan and Lily Smith for violin duet; and Jarred McCormick and Jacob Wilfong for string duet. At the district Solo and Ensemble Festival, Jade Boyd earned a 1 rating. During the Missouri State High School Activities Association (MSHSAA) State Large Group Festival, three orchestra groups participated. The chamber orchestra earned a 1 Exemplary rating and included Aliza Ahmed, David Chien, Anarely Gamino Pinon, Harder, Christie Jiang, Hannah Jones, Khan, Jarred McCormick, Gage Menk, Mitchell, Andrea Moreno-Quintana, Nathan Moser, Andrea Ramon Arango, Lily Smith, Alicia Spalding, Katie Stevens, Surlet, Emily Ta, Varner, Trinity Wessler, Wilfong, and Natalie Young. The concert orchestra earned a 2 Outstanding rating and included Seth Armbruster, James Balch, Teryn Battle, Hannah Berg, Jasmine Carter, Kyle Creelman, Isabel DiSalvo, Nick Foster, Jaylen Greenlee, Chase Heidemann, Kelsey Hendricks, Andrew Holder, Tressa Jones, Reilyn Keeton, Nicholas Krueger, Kayla Lawrence, Lauren Moton, Jabril Muhammad, Ayiana O’Neal, Halee Oliver, Annabella Perry, Brayden Procter, Esteffany Reyes Sanchez, Lena Ridley, Lorelei Ryan, Kayla Simpson, Daniel Smith, Noah Swartwout, Haley Swift, Serena Taylor, Sam Valladares Marquez, Audrey Watson and Brooke York. The string orchestra earned a 2 Outstanding rating and included Desire’ Adams, Christian Banks, Lauryn Berry, Maya Blumenthal, Khris Bolton, Boyd, Camille Brown, Lily Chirwa, Nolan Cobbs, Caitlin Coddington, Chandler Fajardo, Parker Hoynacki, Tyler Hunt, Drake Ives, Nalanie Kassim, Allison Mackenberg, Rachel McCormick, Kylajah Nunnelly, Corey Ogle, Grace Ohlsen, Millen Patel, Hanameel Riede, Kyah Smith, Marcus Swingler, Isabella Tucci, Simon Wacker, Imani Warren, Kiara Wells, and Tyler Wright. The chamber orchestra also earned a Superior rating at the World Strides Festival in Seattle, Washington. Those students were: Aliza Ahmed, Carter, Chien, Gamino Pinon, Harder, Holder, Jiang, Hannah Jones, Khan, Krueger, Jarred McCormick, Menk, Mitchell, Moreno-Quintana, Moser, Ramon Arango, Reyes Sanchez, Ryan, Lily Smith, Spalding, Stevens, Surlet, Ta, Varner, Wessler, Wilfong, and Young. The orchestra is directed by Michael Dunsmoor. Nadia Maddex earned two 1 ratings, one as part of the High Cs during the State Solo and Ensemble Festival for choir. Also earning a 1 rating at state were: Sarah Burke, Aaron Garner, Christopher Tobar and Tony Washington, who earned a perfect score. Students from the seventh-hour ensemble sextet also earned a 1 rating. They are comprised of Alonna Gibson, Trinity Gleghorn, Sierra Jones, Olivia Pursley, Madelyn Radican and Teoni Walker. Chloe Neal and Tamia Tyler also earned a 1 rating at the festival as part of the High Cs. Teacher Melynda Lamb directed the students.